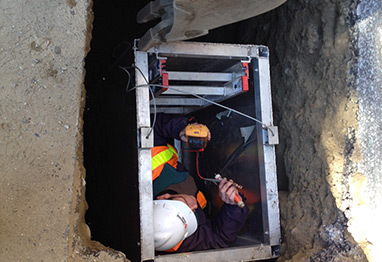 Ultrasonic pipe testing is a non-destructive procedure that introduces a high frequency sound wave into one exterior side of a material, and reflecting the sound wave from its interior surface to produce a precise measurement of wall thickness. The round trip duration of travel, divided by the known sound velocity through that particular material, provides a wall thickness measurement equally accurate to a micrometer reading. This process makes it easier to predict pending pipe failures. As a non-destructive method, ultrasonic pipe testing offers obvious advantages over cutting out pipes for metallurgical inspection. It is non-intrusive, accurate, reliable, safe to both building and inspection personnel, provides immediate results, requires no system shutdown, and is extremely cost effective. BSI primarily utilizes ultrasound pipe testing for condition assessment of water and sewer force mains. Please contact one of our experienced Project Managers to discuss whether Ultrasonic Condition Assessment techniques are the right choice for your next project.